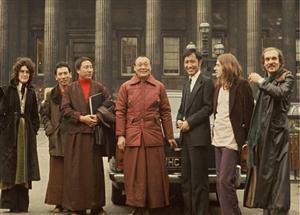 Recently someone e-mailed me a photograph that was taken in 1977 outside the British Museum, which shows, from left to right: Miss Stuart Hamill, Choegyal Rinpoche, Dorzong Rinpoche, Khamtrul Rinpoche, Chimi Rinpoche, myself, and Keith Dowman. In the background is Stuart’s Silver Shadow Rolls Royce ~ she always traveled in style and I pray that she still does, now deep in the heart of Chicago. I possess few photos from my own past, but this one speaks deeply to me and has brought to mind a story I have long wished to write and intend to commence now. I was thirty years old at the time this photo was taken, more than half a lifetime ago, but this frozen photographic moment in time now stands as a poignant reminder before me. Khamtrul, Dorzong and Choegyal Rinpoches had been invited to visit Britain by my friends Noel and Fay Cobb, and for the space of several weeks we all inhabited their small house in the London suburb of Barnes together. Khamtrul Rinpoche was especially precious to us, and his remarkable and enduring presence still shines through to me in this photograph, for there are few beings one meets in life who embody this degree of an otherworldly awareness, empowered gravitas, transparency and innocence. For all of us who knew him he was quite simply impeccable, an archetypal embodiment of the supremely enlightened mind. In 1975, my girlfriend Linda and I had spent the best part of the year living close to the Tibetan Craft Community of Tashi Jong in Himachal Pradesh, Northern India, which had been established in 1969 by Khamtrul Rinpoche in his 8th incarnation as Dongyud Nyima (1931-80). During this period I worked at producing an extensive series of small deity-initiation paintings (tsakali) for Khamtrul Rinpoche, whilst Linda worked as an assistant to Dorzong Rinpoche in the community’s office. Khamtrul Rinpoche passed from this world in 1980, and the last time I saw him was during the time that this photo was taken. However, Linda returned to Tashi Jong after she and I had separated in 1976, and this story concerns her and her devotion to her root lama, Khamtrul Rinpoche. Evam! Thus have I heard. As the main building of Khampagar Monastery in Tashi Jong was nearing completion, the intricately created clay statues that were to grace the temple finally arrived from Bhutan. Under Khamtrul Rinpoche’s detailed instructions, the finest Bhutanese statue makers had been commissioned to sculpt dozens of statues which then had to be gilded, or gold-leafed, before being consecrated and formally installed in the temple. With the delayed arrival of the statues and the approaching advent of the auspicious day on which they were to be consecrated, the task of gilding these clay images was assigned to the artisans, wood-carvers, thangka painters, togdens, and monks of Tashi Jong, of which there were many. Some of these people had lightheartedly suggested that they hoped there could be a miraculous statue in Tashi Jong, just like the levitating statue of Vajrayogini in Bhutan, or the small statue of Milarepa in the nearby Valley of Lahoul that was reputed to grow human hair from its head. Tomorrow did turn out to be better, as Linda slowly began to master the art of this delicate and intricate technique, and thus it was that all of the other statues were expertly gilded by the craftsmen of Tashi Jong with the confidence of their experience. Many glorious days of deep peace and devotion materialized during this time, as everyone in the temple remained fully focused on their respective tasks, and the ever-radiating cloud of Khamtrul’s sublime presence transformed the shrine room into a truly heavenly realm. Finally the day before the rituals of consecration arrived, and although several of the statues were still not fully completed the monks and artisans were given the day off to join their families for an all-day picnic filled with festivities. The only exception to this was Linda, who found herself alone in the temple as the daylight faded with a partially gilded statue of Vajrayogini and a lot of crinkled gold leaf fragments scattered around its base. She had been told that the statue needed to be fully completed by the next morning or the consecration couldn’t begin as scheduled. It was at this moment that Khamtrul Rinpoche walked in and stood watching her plight in silence for a few minutes before leaving again. Power failures were a common occurrence in India at this time, and there happened to be a prolonged power cut on this particular evening. However, Khamtrul Rinpoche soon returned bearing a large torch, and held it high above the statue so that Linda could work on finishing Vajrayogini’s face before he himself could finally paint in colour the three piercing eyes of this goddess. It was past midnight by the time Linda finally finished gilding the statue, and during all these quiet, intense hours Khamtrul Rinpoche had hardly spoken one word to her. Although Rinpoche could have easily taken over this painstaking task, he chose instead to passively stand besides her holding a torch so that she could see properly and bring her heartfelt act of devotion to its consummation. On the following morning the pujas or rituals began, during which all of the statues were consecrated in a three-day offering ceremony. At the conclusion, the statue of Vajrayogini was carried up to the top of the mountain by the togdens and installed as the main deity in the central shrine of their practice centre, where few people are ever allowed to enter ~ as these awe-inspiring yogis maintain their practice in lifelong retreats. It was here that the Vajrayogini statue immediately began to reveal its miraculous power of levitation, defying the laws of gravity with its phenomenal ability to continuously float above the ground. Although I have never been in the presence of this sky-going statue myself, I have been told by both Choegyal Rinpoche and Ani Tenzin Palmo that at first the statue hovered almost two feet above the ground, but slowly and year by year its levitating height has measurably decreased. It is still a common practice to loop and pass a long Tibetan scarf under its base and over its top for those few who are fortunate enough to visit this truly blessed shrine room. Of all the acts of human devotion I have borne witness to, this to me is one of the sweetest and most pure; for I know Linda well in all her humility, self-doubt and deprecation, and like her know well the pain that an oyster has to bear in its solitary act of giving birth to but a single pearl.